There’s no other feeling quite like it! Whether its the sensation of holding the throttle wide open, or the feeling of gliding through turns with your knee scraping the surface of the ground. There’s one thing for certain, you can’t help but come away from every session on the track with a huge smile on your face and the feeling of euphoria. An event where you get to experience your KTM in a manner that differs from where you may normally ride your motorcycle, in a friendly controlled environment surrounded by like-minded individuals. 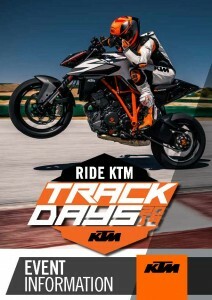 We invite you to come and take part in this event where you will get a chance to feel the “READY TO RACE” roots that run deep throughout the entire KTM Motorcycle range. One Event, One Focus, One Goal. Inspire KTM owners to take on the TRACK no matter what KTM you ride! Gates open 07.00 first bikes will be on track at 09.00.